The List of Titles: Table of Contents? Index? Neither? Most SCA dances are based on dance manuals that have survived from the Renaissance. The commonly-used dance manuals begin with Domenico (1450s Italy), and continue through Playford (which, somewhat controversially, is post-period at 1651). These sources are primarily from England, France, and Italy, but also Spain and Germany. There aren’t many of these sources, although more turn up from time to time. Some of these sources are true dance manuals — books designed to teach a dance from scratch. We have several such from late-period Italy, and they are delightfully detailed. But many are ambiguous, idiosyncratic descriptions written to someone’s personal taste. Often these are apparently “cheat notes” that someone wrote down to remind themselves of how a dance worked. In many cases these notes assume that you already know the general dance style, steps, and figures (often written with unclear jargon). The Gresley Manuscript (“Gresley” from here on) is the earliest known English dance manual. It is describing a dance repertoire that is largely unknown elsewhere, of two- and three-person dances that are, at best, distant cousins of ones we know from Italy. It uses, though does not explain, a lot of jargon for dance steps and figures, leaving us to make our best guesses as to how things work. That said, the dances are interesting, and reconstructions of several of them, including Ly Bens Distonys, Grene Gynger, and New Yer, have been gaining in popularity around the Society. These are not, however, easily danceable choreographies. Period dance descriptions were usually ambiguous and often downright confusing, and these are no exception. The process of taking these descriptions and interpreting them for modern dancers is called “reconstruction”. The Accademia della Danza is currently working on reconstructing these dances. We encourage others to take this transcription in hand, and join in the reconstruction process. Herein we describe the manuscript and our process for creating our transcription. For those interested, the transcription itself can be found here. The full collection of files, including the transcription of the music, can be found here. This shows our transcription of the original source first, and is followed by the way the dance is commonly done in Carolingia. We originally learned this reconstruction via Drachenwald, based on music performed by Gaita. Two doubles forward, then split, the man 3 singles fwd, the woman back. Man ½ turn and both a double back together and take both hands to change places. Split again with man and woman roles reversed, take both hands to change back to starting places. Both single forward and back and then full turn away. Note: the name “Ly Bens Distones” is never used as such in the manuscript. It is a common hybrid of the names we find in the main text and in the list of titles at the front. We believe that “de 2[bus]” signifies that it is a two-person dance. The existence of the Gresley Manuscript was brought to the attention of the dance community through David Fallows’ 1999 article. This includes a historical introduction, and transcriptions of both the text and the music. The transcription is not completely diplomatic (an academic term meaning “matching the original in both content and form as closely as possible”), and it is covered by the journal’s copyright. The source is referred to as the “Gresley manuscript” because it is part of the Gresley collection in the Derbyshire Records Office in Matlock, England. The author might have been associated with the family of Gresley of Drakelow, or the book could have come into their possession at a later point. It has been dated to circa 1500. The Gresley Manuscript was created in England and currently resides in the UK and is subject to their copyright laws. Additionally, as an unpublished work, it is governed by changes to the law that were enacted in 1988. Prior to 1988 works in the UK were under copyright for 70 years post-mortem for works published by a living author and 50 years from publication for works published posthumously. The copyright clock for unpublished works did not formally start, therefore these works were under copyright in perpetuity. The 1988 law, which actually went into effect in 1989, provides a 50 year term for unpublished works, hence the copyright for all unpublished works of sufficient age will expire in 2039. This created a class of orphaned works, works which are under copyright but where the owner is unknown or cannot be found. For these works full publication is impossible until copyright expiration in 2039. A 2014 update to the law carved out exemptions for “libraries, educational establishments and museums, as well as archives” to make use of these orphaned works, including digitization and providing on-premise access. It also created an Orphaned Work Licensing Scheme which provides for seven-year, non-exclusive licenses for these works, but only for publication in the UK. As an unpublished work, the Gresley Manuscript is under this law and copyright until 2039. Although the Derbyshire Records Office has a complete digital facsimile, they cannot give or sell a copy of it. We were able to get digital copies of pages 50-79, which include the List of Titles, the dances, the music and the final page of the Latin text on physiognomy, under the copyright allowance for “non-commercial research or private study”. Under this exemption the Records Office was only willing to provide those pages and we are not able to distribute them either digitally or in print. There has been a great deal of theorizing about the purpose of this notebook, both in our group and beyond. We think it can be stated definitively that the purpose cannot be known for sure based solely on the manuscript itself. This is unfortunate, since the purpose clearly affects how to approach the descriptions and therefore it affects the reconstructions. It has been suggested that these are notes jotted for personal use while learning each dance. It has been suggested that these are notes or a draft for a possible future publication. There are likely more suggestions that we haven’t even heard. Herein we present our current theory, to add to the debate! People in period made reference books for themselves; we refer to them now as “commonplace books.” Since there are several other topics covered in the same notebook, and since those notes are known to have been copied from other reference texts, it put us in mind of these kinds of personal reference books. This source is not someone’s rough notes, it is an archive. The section begins with a list of titles, which is normally interpreted as a list of dances, but could instead be a list of music. Most of these do not have associated dance notes, and some are well-known tunes. This list is sorted by first letter, but neither the dance descriptions nor the music follow this order. These descriptions are densely written; when one dance ends the next one begins with no whitespace separation, but there are relatively generous margins which contain the dance titles and other information. The first set of dance descriptions have marks in red ink that make the clause divisions easier to see. The music pages are less densely written than the descriptions. There are blank pages, so there was space for more dance descriptions or music if that had been wanted. Someone valued this information enough to go to some trouble and expense to make a reference work, and this was the format and content he wanted. The Gresley MS includes seven pages of music in landscape orientation, numbered 73 through 79. Pages 73 through 75, which are paper, are badly faded with water damage and some areas bear only the faintest trace of the original contents. The remaining four pages are parchment; these are in better condition and the ink is darker. The music, like the text itself, being handwritten, does require some interpretation. Each page contains 3 staves, and it is not clear how many pieces of music they comprise. There are many more corrections and erasures in the music section than in the dance text. The music is presented in 15th-century white mensural notation. It consists of a single melody line written on a five-line staff. The lines of the staves appear to have been drawn with a straightedge, but they are not uniformly parallel or evenly spaced. Mensuration signs are not included. Several C clefs are used; the music is mostly pitched in the tenor range. Note values range from breve to semiminim, including dotted note values and one rest. 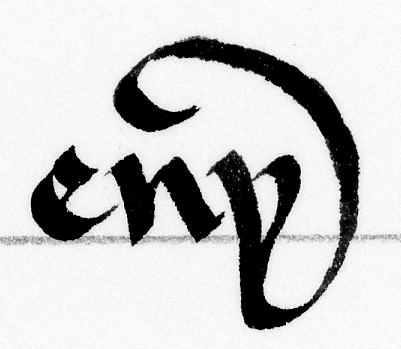 Note heads for minims and semiminims are triangular, and note-heads for semibreves are loosely diamond-shaped, but sometimes have a triangular appearance. No ligatures are used. Bar lines in the modern sense are absent, as was typical in this period. Multiple vertical bars appear at the very end of several pieces as a kind of line filler or final flourish. Single vertical bars are used in places to divide the music into sections. For some of these sections, a numeral is written above the music; these numerals have been interpreted as repeat instructions. We note that some of these marks, which have been transcribed in other articles as the numeral 1, resemble signa congruentiae. Since these marks float above sections of music rather than being attached to specific notes, and because of their resemblance to other numerals in the manuscript, they are interpreted here as numerals. There is text written above and between the lines of music, and in two places on the staff itself. Most pieces are given what appears to be a title, written above the beginning of the music in a hand very similar to that used for the dance choreographies. On pages 73 and 74, some titles, and some sections of music, appear to have been struck out with horizontal strokes. For the first piece on page 73, a new title is given after an obliterated one. Some of the text which occurs between two lines of music has been represented here as being below the previous staff, rather than as a title above the next staff; these assignments should be considered open to interpretation. 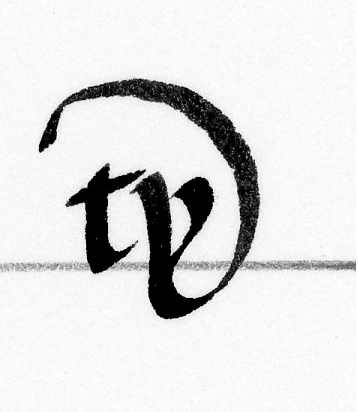 The legibility of the scribe’s handwriting has been unfairly impugned. The hand, which is very close and contains abbreviations, requires familiarization before it can be read easily, but the script is clear and well-executed. The use of abbreviations is not consistent, but the symbols are reliable in their meaning when they appear. The spelling, on the other hand, is quite unreliable in a way that is typical for the period. Even when a term was spelled in one way most of the time, that was no guarantee that it was spelled that way all of the time. We do not believe that spelling variations have any bearing on the interpretations of the dance steps (eg. a “torn” is equivalent to a “torne” and they both mean “turn”). Similarly, the variations in phrasing choice (eg. “torne” vs “torne about”) do not appear to have separate meanings when it comes to dance steps, though that is harder to verify. We did make an effort to look into whether we could use phrasing variations to help us with reconstruction, and it was not successful. The author appears to sometimes want to add more clarifying words, and sometimes not. The scribe of the book is assumed to be one John Banys. Though his identity is unknown, the name appears twice in the book in the same hand, once within the dances on p. 66, as “Johnes Banys”, and once on the inside back cover, as “Johnes Banis”. The entire notebook is 90 pages, a mix of vellum and paper, with outside dimensions of 4.75×3.75 inches. 1-33: A text on Chiromancy (palm reading), taken from The John of Seville Chiromancy, in Latin. 35-50: A text on physiognomy (the reading of faces). This Latin version, called the Secreta Secretorum, was translated by Philip of Tripoli. The text of the dances is in a block 3.15 x 2.25 inches, with the outer 0.15 inch devoted to the titles and marginal numbers. The block varies from 17-19 lines per page and although there is no visible ruling, the blocks are consistent and well justified. In the List of Titles, however the lines are not consistent between columns. The List of Titles, first section of dances (pp. 54-66), and music are done in a dark brown ink. The start of the dance description is usually indicated with a red pilcrow sign, and often the start of a new clause begins with a red stroke. The second section of dances (pp. 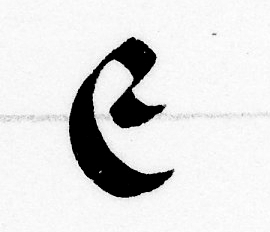 67-72) lacks any red highlighting or pilcrow marks, so the dances start only with a capital letter. Outside the text block are titles (often set-off with a border), dance set size (for two or three), and large arabic numerals (between 1 and 3, mostly 2 and 3) whose meaning is still unknown and which are missing from the second part. For months, we thought that the numerals included a 4, but after extensive comparison, we decided they were really a 2 conflated with a poorly-aligned box. 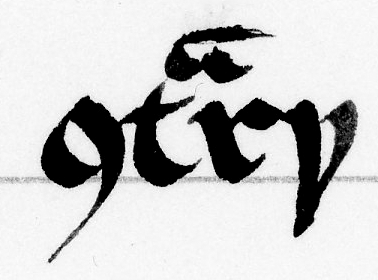 Two sample lines from the Gresley manuscript; all samples recreated by Thyra Eiriksdottir. Click for a larger view. The paper leaves are water damaged and have been reinforced with a tissue-paper overlay, making any watermarks nearly invisible, but on pp. 45 and 51 a watermark in the shape of a Gothic “Y” is visible. Similar watermarks are found in the second-half of the 15th century, most commonly in the 1470-80s. There are many abbreviations used in the text. Many of these are quite standard for the time period, and are used almost consistently. 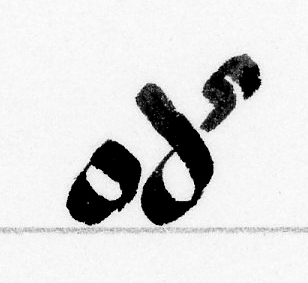 The author uses ampersands for “and” and þe for “the” about half of the time, and writes the words out the other half of the time, even within the same dance. There were a few instances where the abbreviation or spelling variation caused confusion as to what the text conveyed. The words are usually decipherable but the meaning can be obscure. While this does not cause confusion in reading the words, it does introduce questions as to whether there was a meaning to the use of extraneous notations. We have chosen to ignore them for the time being. Before the dance descriptions in the notebook, there is a list of what appear to be dance titles. Although it appears at the start, this is by no means a modern table of contents. It has a tabular format, and the dances which are described are all listed therein. However, it is alphabetically organized, and contains no information regarding the order in which the dances appear thereafter. Also, it contains more than 3 times as many names as there are dances described later, and several of the described dances are listed by an alternate spelling. (There are 92 titles, and 26 dances described). The list is tidily written and ends well before the end of a page, and there are no corrections, erasures or added lines. All the musical pieces that have legible titles are included in the List of Titles. Considering that the list is alphabetical and more “complete” than the descriptive section, and there are no blank pages after the list, it seems likely that the list was prepared first, with the intent to fill in the descriptions subsequently. This bolsters the interpretation that these pages were written with intention to be a reference for later use, and not a collection of notes taken while learning to dance. In our experience, the List of Titles tended to cause more confusion rather than answering any of our questions about the correct names of dances, or their provenance. Our primary goal for this project has been to create a transcription that is open for reuse, with additional commentary explaining our editorial decisions. We also hope to encourage further work on the manuscript throughout the SCA. This initial phase provides a transcription of the words and music notes. We intend to put forth some interpretation and discussion that will hopefully be useful for reconstruction, by our group or others. We would be happy to make the information contained within the manuscript more available. Fallows, David. “The Gresley Dance Collection, c.1500.” Royal Musical Association Research Chronicle, no. 29 (1996): 1–20. Available online from both Taylor and Francis and JStor. “EUR-Lex – 32012L0028 – EN – EUR-Lex,” accessed May 14, 2017, http://eur-lex.europa.eu/legal-content/EN/TXT/?uri=CELEX%3A32012L0028. “Copyright: Orphan Works – GOV.UK.” Accessed September 10, 2017. “Exceptions to Copyright – GOV.UK.” Accessed September 10, 2017. Bernstein lists 1015 entries with a letter “Y” watermark with a mean date of 1472. “Bernstein – The Memory of Paper.” Accessed May 7, 2017. (In the Catalogue under Browse Motifs, navigate to letters/digits->one letter-> letter Y). The Carolingian Accademia della Danza was founded in 1992, as a complement to the long-running weekly local dance practice. The practice was open and social, so it tended to avoid the more demanding dances and was not a good venue for research. The Accademia della Danza was created as a place to focus on dance research and performance. It has run on and off over the past 25 years, under a variety of leaders, on many projects. We usually spend anywhere from 6 months to 2 years on a given project, delving deeply into it before moving on to the next subject. Past projects have included sections on Domenico, the Basse Danse repertoire, Caroso, Ebreo, Pattricke/Lovelace and many other topics. The Accademia has always been intensely collaborative. We get together once every month or two, frequently starting with a meal, and work through the next section. Our ethos is built around the idea that more eyes on the problem are usually better, and even the newest members can provide new insights. We like to include a variety of skills — the current group includes a musician, a scribe, and a specialist in manuscripts, as well as dance specialists. Decisions are made by consensus whenever possible, and our meetings tend to be boisterous.